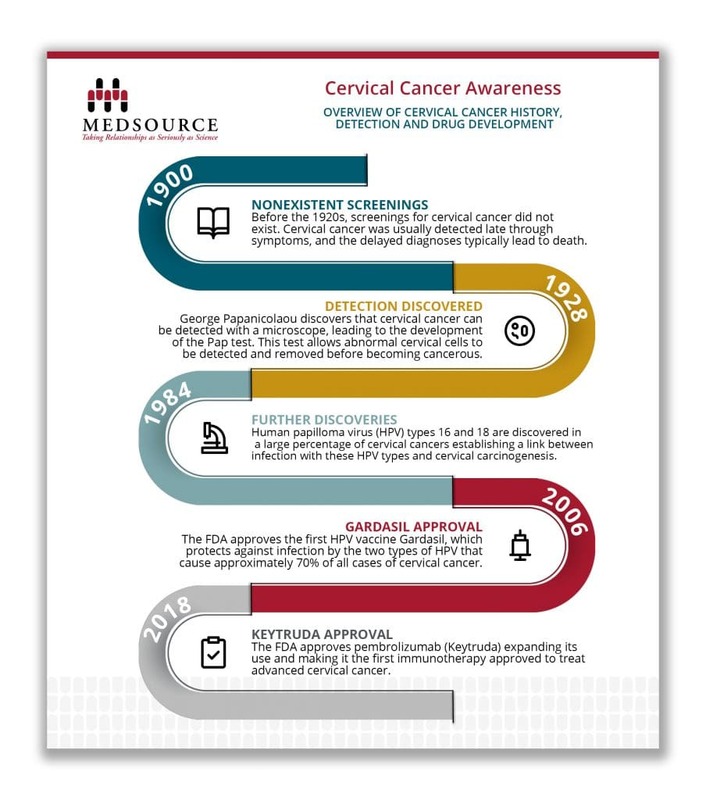 In 2019, approximately 13,170 new cases of invasive cervical cancer will be diagnosed. From these cases, nearly 4,300 women will die from the disease. Once the most common cause of cancer death for American women, cervical cancer now ranks 14th in frequency due to the increased use of the Pap test. Most cases of cervical cancer are caused by specific types of the Human Papillomavirus (HPV). While there are more, approximately 15 of these are considered to be cancer-causing cases. Two of these high-risk types, 16 and 18, cause about 70% of cervical cancers worldwide. Treatment of cervical cancer depends on several factors including the stage of the cancer, other health problems, and patient preferences. The first vaccine for prevention of HPV and HPV related cancers such as cervical cancer, Gardasil, was approved by the Food and Drug Administration (FDA) in 2006 protecting against two types HPV. A new version of the vaccine called Gardisil9 was later approved in 2014 including protection against 9 types of HPV. Treatment options for cervical cancer include surgery, radiation, chemotherapy, targeted therapy, and immunotherapy. The most recent therapies approved to treat cervical cancer include bevacizumab (Avastin) and pembrolizumab (Keytruda). Bevacizumab (Avastin) was the first biologic agent and targeted therapy approved for patients with late-stage cervical cancer. Pembrolizumab (Keytruda) was approved by the FDA in October 2018 to expand its use making it the first immunotherapy approved to treat advanced cervical cancer. The accelerated approvals of both treatments demonstrate the commitment to quickly making promising therapies available to patients with cervical cancer. MedSource continues to focus on complex diseases, applying our particular expertise in oncology to help support patients worldwide suffering from cancer. We are proud to support Cervical Cancer Awareness Month. We ask that you join us in our efforts. Join us in spreading awareness and educating the community on the types and treatments of cervical cancer. To learn more, visit the American Cancer Society at www.cancer.org.